Todd Denkin appeared once again on MoneyTV with Donald Baillargeon to talk about cannabis lab testing in Nevada and how Digipath Inc. got started. Digipath has evolved over time to additionally become a cannatech and a cannadata company as well. 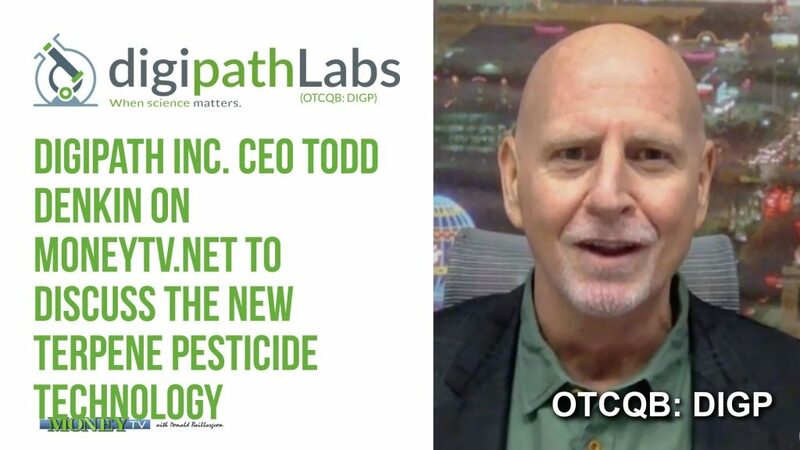 The provisional terpene pesticide technology patent Digipath Inc. has applied for has the potential to reach far beyond the cannabis industry and into other traditional cash crops here in the United States and abroad. People are generally unaware of how large a role terpenes play in aromatherapy, the effects of cannabis and its other applications. “As you know we started as a cannabis testing lab in Las Vegas. About four years ago we applied for our license here. Over that span we have built a high end and very high tech cannabis and hemp testing laboratory in Nevada. We have built an ISO certified system here in Las Vegas and now our plan is to duplicate what we have done all over the country and even worldwide. “We are evolving though,” Todd Denkin continued. “So, you are catching us right in the middle of our journey. We are evolving into a cannatech and a cannadata company. We believe these are really great verticals to be in because our business model is right at the intersection of cannabis, technology and data. Over these past four years we’ve discovered and amplified these derivative businesses that we hope to establish as significant revenue producing operations. “Well terpenes have become very exciting for us. For those that don’t know, a terpene is a chemical made in most every plant. Even the human body produces terpenes. They are very significant in cannabis as well and it’s the chemical that gives the cannabis its smell and its taste. They play a critical role in the way other chemicals function. I’m sure you have heard of the entourage effect that you get from cannabis. “Terpenes also have very potent standalone powers as well and from our observations and analysis of terpene chemical profiles, over tens of thousands of individual flower samples right here in Las Vegas, we came up with a method of arriving at terpene combinations that can be formulated and applied to crops to prevent any kind of microbial contamination. “So, the terpene tech can be used for more than just cannabis?” Donald Baillargeon asked. Todd Denkin and Digipth Inc. are interested in spreading awareness about their work and helping the scientific community better understand the cannabis plant. Marijuana lab testing in Las Vegas has provided an incredible opportunity to collect all sorts of cannabis data including information about terpenes and cannabinoids.